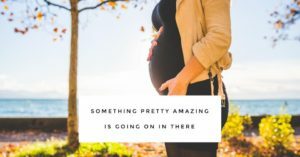 Positive Birth Experiences Are Open to Everyone Even You! You are not weak; so let's knock that one on the head before we start. You are growing a baby, you are doing the most amazing thing, nurturing and nourishing a whole new life. I know you don't want any special allowances made either just because you are pregnant. But let me share this with you .... if you're not 'keeping up' with our old life now in pregnancy it's okay. It doesn't make you vulnerable or weak. And no-one thinks any less of you (spoiler alert: because they are too busy thinking about themselves). Society may not value Mums enough but that doesn't mean you, I or anyone else for that matter needs to follow that poor, woefully outdated example. You have choices and you do not need to change. And trust me here you don't have to go vegan to fit. Nor do you need to start yoga classes. And you don't need to go all green and crunchy either. Positive birth experiences are open to everyone and to claim yours you need to embrace your own inner brilliance, develop self-empowerment and make the right decisions for you. You need to know what's important to you, your partner and baby and then equip yourself with some new knowledge, skills and self-understanding for a positive birth and start to parenting. And that's exactly what we do when we work together. We say goodbye to self-doubt, feeling overwhelmed, scared and anxious. We embrace your flexible thinking, reason with the high expectations you may have set for yourself and find your unique formula for a calm, confident and courageous birth and start to parenting. Take the next step, book a time to chat https://sarahbrent.as.me/ and find out if this is the right next move for you. You have nothing to lose and everything to gain.